This Border Collie will never jump on visitors, leave muddy footprints on the carpet, pee or poo in your house or need visits to the veterinarian. Chase doesn't chew on furniture and will never need crate training. Chase doesn't sleep on your furniture, steel dirty laundry, counter surf or bark and whine for attention. This puppy never needs exercise, mental or physical stimulation and won't herd your children or other pets or livestock. Chase needs no grooming, bathing and his coat doesn't mat from not brushing him a couple times weekly. If you are looking for the perfect Border Collie, then this is the one for you. All puppies and dogs need visits to their vet, eliminate several times a day, bark and jump on people unless trained with good canine manners and thrive on attention from their humans. Grooming, exercise, training and a 'job' are paramount to this breed. 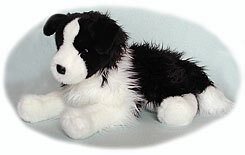 Border Collies range from 18" to 21" and weigh from 35-50 pounds full grown. Many do not mature physically or mentally until they are 3 years old! Border Collies are wonderful dogs, but this breed is NOT for everyone. Please do your research and talk to many Border Collie enthusiasts before you bring this breed into your family. It is said Border Collies are the most intelligent breed, for some opening doors, gates or kitchen cabinets is a simple task. Border Collies are true survivors, they can outsmart, outwit, and outlast the best of us!